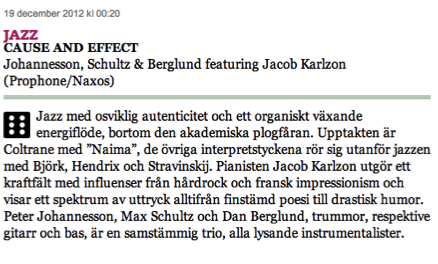 Högsta betyg för "Cause and Effect" i Svenska Dagbladet 19 december 2012. Fler recensioner här. Peter Johannesson was born in 1962 and started to play the drums at age 12. Two years later, he met legendary jazz pianist Herbie Hancock after a concert in Stockholm. Herbie and his band took an immediate liking to Peter, and invited him to join them for the remainder of their Sweden tour. During the sound check before their concert at Göteborg's Concert Hall, Peter was invited to sit in on the drums, and that exhilarating experience sparked off his life-long urge to create high-energy, spontaneous music. Herbie and Peter continued their collaboration through several tours of Sweden, the first time in 1988, then in 1990, 1991 and 1993. The album Sixtus featuring Herbie Hancock (EmArcy/Universal) was recorded in 1995. 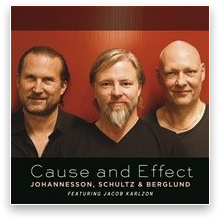 They played together again in 2003 at the Stockholm Jazz Festival. 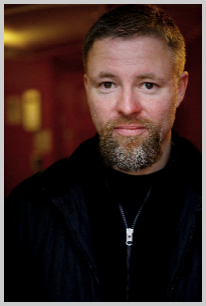 Peter Johannesson is also an experienced composer. In addition to writing music for his different bands, he has composed the score for several theatre and TV productions. Peter has performed in various settings with, among others, Svante Thuresson, Viktoria Tolstoy, Peps Persson, Herbie Hancock, Larry Coryell, Eric Bibb, Håkan Broström, Jojje Wadenius, Esbjörn Svensson, Nils Landgren and Mats Ronander.